Llancarfan, situated between Barry and Cowbridge in the heart of the Vale, will soon be able to enjoy some of the fastest and most reliable broadband speeds in Europe as a result of Openreach’s Community Fibre Partnership (CFP). Dr David Smith is a consultant cardiologist who lives in Llancarfan and practises at Morriston Hospital. Dr Smith says that having ultrafast broadband fed directly to his home will be a game changer for the way he works. Thoughts of having to relocate his local tractor dealership due to poor connectivity have now been put aside by David Evans who runs Llancarfan based – DEAL Tractors. With ultrafast broadband now on its way David explains how difficult it has been to run his business with poor connectivity: "With e-commerce being ‘the norm’ it is imperative that a rurally based business like ourselves has access to the fast internet connectivity that urban areas benefit from. “It is impossible to perform even the most basic of tasks like downloading software upgrades, internet banking, marketing and social media and there have been times when only one member of staff has been able to be active on the internet at one time due to the speed. Welcoming the announcement Martyn Hughes, Chairman of Llancarfan Community Council, said: “We’re incredibly excited about finally securing ultrafast broadband for Llancarfan and the surrounding community. The delivery of this project will see the entire village connected – including more than 25 businesses and a large number of people who work from home. It will without question digitally transform every aspect of our lives. “It will enable an elderly resident to have video calls with her family in Australia, allow children and students to access educational material online at home, farmers to conduct their business, much of which is internet based, and of course allow access to many other online streaming services enjoyed by most residential households elsewhere. “I would encourage all communities across Wales who are struggling to access an acceptable or cost effective broadband service to investigate the options an Openreach Community Fibre Partnership like ours can offer. For us as a Community Council, leveraging the 'Access Broadband Cymru' grant from the Welsh Government and engaging with the Openreach CFP team became an incredibly straightforward and expedient process. The key to the success of this has been the strength and support from the local community." 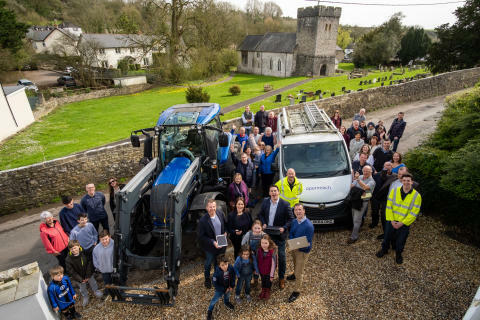 Connie Dixon, Openreach Partnership Director for Wales, said: “It’s great that we’ve been able to work with Martyn and the Llancarfan community to find a broadband solution that works for them. “Partnerships like this help us bring high-speed connections to those areas that broadband providers, for a variety of reasons, struggle to upgrade alone. The deal is expected to see the first properties get the ultrafast service in March next year. Fibre-to-the-Premise (FTTP) technology will make broadband speeds of up to one gigabit per second (Gbps) available which is around 22 times the UK average speed  and enough to stream 200 HD Netflix movies simultaneously . Openreach’s UK-wide Community Fibre Partnership programme is bringing fibre broadband to some of the UK’s most challenging areas.More than 800 communities have already signed up to the programme including many across Wales. Once Openreach has installed the infrastructure, residents can place an order for the new faster services with a provider of their choice.